a work in progress: Ready, Set, GO! The snow will fall so the kiddies will play. And play they did. Inside? Yep, Indoor sledding. I can not even tell you how much snow fell at our house this morning. It was crazy. Not one of the Watson kids were all that excited about going outside to play. Consequently the kids just made fun of their own. Sure it was at the expense of the poor mattress and did that mattress take a serious beating. And the poor door at the bottom of the stairs. 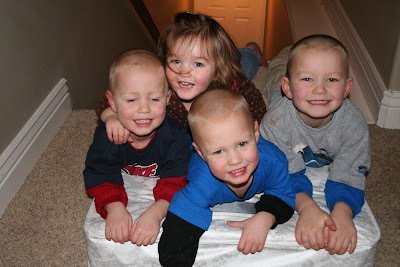 There were lots of laughs and giggles and sometimes that is more important than the mattress or the door. I love it when they play play play. And they played for hours. That makes for a couple cute pictures and one happy mom. We used to call those santa sleigh rides at the Renown Dr. house...only there were a few more twists in the stairs and a harder landing. Okay I think they have gotten bigger since I have seen them last, please tell them Aunt Lyss said no more growing up! They are too cute and how creative the little muchkins are! Love love love them. FUN! FUN! FUN! and all of them together w/out broken bones--that's pretty good balance and talent. I can't believe how big your kids are! You must have your hands full! I am stressing about having a third in a couple of months! Cute kids! My kids love sliding down our stairs too. We love indoor sledding too! Just last week our kids got on their snow pants and giggled up and down the stairs sliding for an hour. Cute pics... they are very creative! Love that they were entertained for hours... I'm sure it made for a happy mom! Hi there! I missed a lot again! Such cute pictures and posts. We got your cute christmas card. We sent one to you too, but it got returned. I guess I didn't pay attention to your new address. Can you give me you new address so I can send it again. Thanks! This is something I would totally want to do! I think that would be so fun! Kind of like on Princess Diaries 2! And without even getting cold! You can't beat indoor sledding. 'em cuz they're too cute, can't shoot 'em cuz they're too onry, so we just got'a hug'em and love'em as much as we can! Are you sure Jaq is still there? Because there have been threats about her vanishing to parts unknown in the north just for the purpose of some general squeezing and spoiling! Course you do have a set of boys... you'd never know if one was missing would you??? Love how creative they are! Happy sledding kiddos~!